This week there was a major sell-off in tech - including Facebook and the rest of the FAANGs, Instagram announced it has reached 800 million users and at this pace could be larger than Facebook, and Tesla has new competition in the Electric Vehicle market from Dyson. “Was Monday’s major sell-off in tech the beginning of the sector rotation that everyone is waiting for? No its not, and it won’t be. People want growth, in a low interest rate low inflation environment no one is going to buy anything but growth.” - Senior Internet Analyst at a global investment bank when we met this week. His comment was after a roller-coaster of a week. On Monday there was a sharp rotation with the S&P tech sector falling 1.4% and the energy sector rising 1.5%. Facebook and Alibaba were down almost 5%, and many other high profile tech stocks were down 3-5%, including semiconductor stocks AMD and NVIDIA and the computer game stocks EA and Activision. But the sell-off only lasted a day, and the tech index is now back above its level last Friday. This internet analyst conceded that virtually every stock is close to his price target, and that every stock is crowded with fundamental investors structurally overweight. Australian investors aren't immune - some of the largest Australian based global funds have technology holdings 20-30% higher than the index weight (some use their own industry classifications rather than the standard GICS classification so appear more diversified than they are). Investors have strong views - the bulls argue this is a unstoppable secular trend and you can’t own enough, and the bears say prices have gone up too far too fast and some companies are expensive. Both sides make good points, and I am not in either camp. I think you need to be selective, owning some of these secular winners but only buying where valuations are supported by earnings and where share price increases are supported by fundamental improvements. Facebook is a good example. Over 2 years its share price is up 90% but this is fully justified by earning. Analysts have revised their forecasts for 2017 earnings by 118% and 2018 earnings by 81%, illustrated in the following table. Keep in mind that most companies struggle to meet analysts longer term estimates - for example Apple's estimates are down 17% over the same period Facebook's are up 118%. Imagine if Facebook's earnings expectations hadn't increased and its shares were down 13%, following the PE derating, rather than up 90%. Would the commentary then be how cheap Facebook is even though it is on the same valuation? Apple is up 'only' 35% vs Facebook up 90%, but which one is more justified? Facebook is valued at 27x 2018 GAAP EPS, and lower if you back out the investments in video, augmented reality and messaging which generate no earnings but have significant potential; and lower still if you account for the acquisition of WhatsApp as a purchase cost rather than employee share amortisation. It is trading on <20x 2019 consensus earnings, and 16x 2020 earnings, with a track record of doing much better than consensus. Is Instagram the next Facebook? Facebook’s Instagram social platform has reached 800 million monthly users, revealed on Monday at AdWeek. 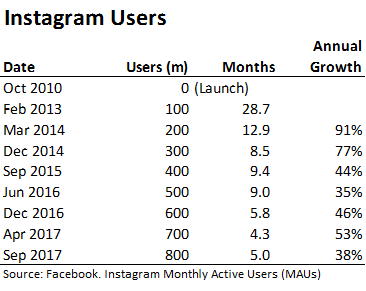 The table below shows Instagram’s user growth. Consider this growth profile. From 2014 to mid 2016 it was consistently taking 9 months to add each 100 million users, and because of the larger base the annual growth rate had dropped to 35%. Then something changed around the middle of last year. Critics point to Instagram copying Snapchat features like Stories and there is some truth to that, but who gets the credit is less important than the observation that Instagram introduced a number of new features and increased the pace of innovation and experimentation. How does it pass Facebook? Facebook has over 2 billion monthly active users. In less than 3 years Instagram will have more users than Facebook has today at a 40% growth rate. What is perhaps under appreciated is not the potential user base of Instagram but the monetisation opportunity. Its focus on photos and videos, as well as the newer personal features, has the potential to be more engaging and attract even more user time. Users on the platform are spending twice as long on average watching video than a year ago, a statistic also announced at AdWeek. That means more ads and more revenue. What is Facebook's stock worth if Instagram grows to be as large as Facebook and is even more profitable? Dyson announced in an internal company email this week that it is developing an electric vehicle, set to be launched by 2020. It wasn’t exactly a surprise as there were rumours for years - Dyson started in 2015 and it is hard to keep the hiring of 400 engineers, including two executives from Aston Martin, a secret. Media coverage is focused on how difficult it is to enter the automotive market: cars are expensive to develop, take years of testing to be approved for sale, scaling manufacturing is challenging and competition is intense not just from Elon Musk's (aka. Iron Man) Tesla but every existing car manufacturer as well as other tech giants and startups. A few give Dyson credit for its engineering and marketing expertise, but probably don't go far enough. I wouldn’t want to underestimate this company. After all, it has been making battery powered appliances with electric motors for longer than anyone. It is hiring an extra 3,000 engineers by 2020 and works with more than 40 universities globally. Dyson has budgeted around £2.5 billion for its EV project. But it is their battery IP that might be most interesting and give them a real shot. In 2015 Dyson paid $90 million to buy Sakti3, a solid state battery company. The company is headed by Ann Marie Sastry, a former professor at the University of Michigan who left in 2012 to focus on her start-up. Solid state batteries could improve the energy density of Lithium-Ion batteries by 2-3x, replacing the liquid electrolyte with a thin film of solid material. If someone is first to market with that sort of improvement they would have an enormous advantage. Tesla's famed Gigafactory would be obsolete. Consider also that Dyson first invested in Sakti3 as a minority shareholder, bought out the other investors in 2015, and is just now deciding to scale its EV project and invest £2.5 billion. This is a calculated investment, and James Dyson is literally betting the firm on its success. There is some mystery here as Dyson abandoned its $200,000-a-year license for Sakti3’s patent portfolio from the University of Michigan. Perhaps Sakti3 has pivoted and the initial patents are no longer valuable? James Dyson is a very savvy businessman and an amazing engineer/designer. I would not want to take Dyson on as a competitor. I reckon Elon Musk should be very wary. Another fantastic article, will be interesting to see Dyson in the electric car industry and great insight in to the Facebook valuations. I'll look forward to seeing the research work through to the positioning for investors in the Alphinity Global Equity Fund.